Karan Johar responds to Pandya-Rahul issue, says he feels "responsible". Cricketer Rahul Dravid also breaks his silence on the issue. Pandya and Rahul have faced major backlash because of comments made on the show. 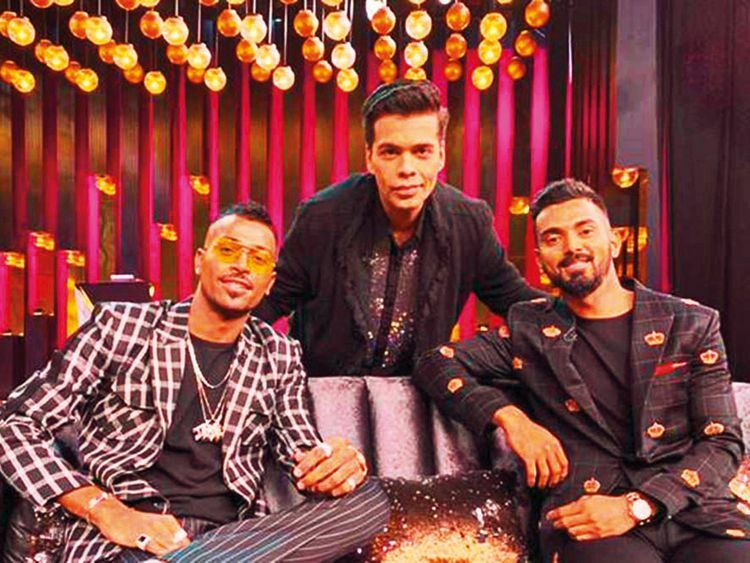 Dubai: Bollywood director Karan Johar said he feels “responsible” for what happened to Indian cricketers Hardik Pandya and K.L Rahul, after comments made by them on an episode of his talk show, Koffee with Karan, faced online backlash. The two had made sexist, racist and misogynistic comments, which has led to their suspension by the cricketing board. Johar, the host of the show, finally broke his silence on the issue and said that it has escalated “beyond [his] control”. Johar added that the questions he asked the cricketers were questions he asks anyone who appears on the show, including women. Johar called the talk show “frivolous” and “borderline ridiculous”, and said “stop making sense” is the show’s mantra. Despite the nature of the show, Johar clarified that he does not justify the comments made during the interview and said that things were said that may have “crossed boundaries”. In the interview, Johar said that he identifies as a feminist and has been raised by strong women in his life. He had no intention of offending women, through that episode. Johar is in Davos for the World Economic Forum along with filmmaker Sharmeen Obaid-Chinoy from Pakistan to discuss the power of film for diplomacy. Former Indian cricket captain Rahul Dravid has also addressed the Pandya-Rahul issue and has asked people to “not over react”. According to a previous report by the newspaper, former cricketers Anil Kumble, Virender Sehwag, Mohinder Amarnathl and more, have discussed the need to address issues of grooming youngsters. In the same report, the Board of Control for Cricket in India’s (BCCI) operations manager, Saba Karim, is quoted: “There are certain things within our control. Some are not. At various stages we organise lectures for the youngsters on handling the media, understanding the laws and managing finances. Dravid is presently the head coach of India Under 19 (U-19) team and the national India A cricket team. Despite apologising for the inappropriate comments made on the show, Pandya and Rahul were sent home from the Australia Series, and the grooming brand Gillette dropped Pandya as their ambassador.